How can I cure shin splints from running without taking time off? That is something most of us have wondered at some point. Shin splints has halted most runners at some point, and can be heartbreaking for runners who have just started to get going when that familiar pain makes an appearance and risks our racing schedule. Medial tibial stress syndrome, more commonly referred to as “shin splints,” is probably the most universally-known running injury. Shin splints usually appears as an aching pain on the inside of the shin, near the border of the tibia and the calf muscles. The area will often be sore when poked or prodded, and will initially hurt at the end of a run. If you keep running on shin splints, the pain will move to a more sharp, burning sensation, and may hurt during your entire run, or even when walking. Shin pain can spreading out over many inches along the length of your shin bone, or be very painful in a small area less than two inches long. If you continue to run on shin pain, especially when it hurts in a very specific area, it may develop into a tibial stress fracture, which will require up to six weeks of no running. If you think you may have a stress fracture, this can diagnosed by an MRI or a bone scan ordered by an orthopedist or podiatrist. 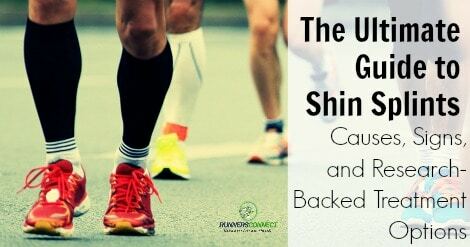 Today we are going to look at what causes shin splints while running, how to prevent shin splints from getting worse (without stopping running), and research backed treatment options for shin splints including both conservative and aggressive options. Finally, if you do have to stop running, we will give advice on how to get back to running after your time off to make sure you do not get shin splints again! In contrast, very few experienced runners have to deal with shin pain on a regular basis. Understanding the mechanism of injury can help explain why. For a long time, shin splints were postulated to be a soft tissue injury. Many of the muscles of the lower leg, including the calves and the smaller muscles above the ankle, insert along the tibia. It was proposed that tightness or weakness of these muscles caused them to tug at their insertion point, irritating the periosteum, a thin, skin-like structure that envelopes the tibia itself. This distinguished medial tibial stress syndrome from tibial stress fractures and stress reactions, which are indisputably true bone injuries. Advanced medical imaging studies have illustrated that all overuse injuries to the tibia, from mild cases of “shin splints” to true stress fractures, exist on a spectrum of bony injuries. Runners with tibial stress fractures often have larger areas of lowered bone density around the fracture. With this new information, scientists now hypothesize that the root cause of shin splints is repeated stress to the bone during running, caused not by straight-on impact, but a slight bending of the bone when it is loaded. In healthy runners, the bone stress after a long, hard run is not a problem. The body responds to the stress on the bone by remodeling the tibia to be stronger and thicker. This is why shin problems are more common in less-experienced runners: their bone has not yet adapted to the stresses of a high-impact activity like running. Unfortunately, this remodeling process takes several weeks to a few months to complete, and there is a period where the bone is actually more vulnerable to damage. Just like remodeling your house entails tearing out some walls before adding new construction, your body has to tear out some of the old bone tissue before strengthening it. As a result, having a small tibia or weak bones puts you at an increased risk for shin splints, since your weakened tibia is more vulnerable to injury when it is remodeling its bone structure. The current theories for treating and preventing medial tibial stress syndrome revolve around reducing the relative amount of stress on the tibia. Reducing impact and tibial loading, strengthening the supporting muscles, and strengthening the bone itself should all lower your risk of developing shin splints and may also speed recovery. 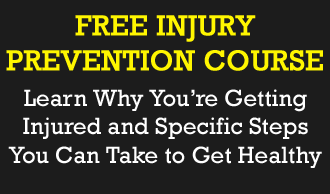 Unlike some other running injuries, there are no solidly vetted treatment protocols. Rather, what follows is an extension of work on the precipitating factors for shin splints. This is a good sign, as many other injuries respond poorly to treatment with orthotics. Custom inserts might shift the distribution of pressure on the bottom of the foot, which may be associated with shin pain. Nevertheless, orthotics are not a panacea and shouldn’t be your only treatment method. Many runners find good success with over-the-counter semi-rigid orthotics like the SuperFeet or PowerStep insoles, and these are much cheaper than custom orthotics, so give them a shot first. Among more exotic treatments, extracorporeal shockwave therapy (ESWT) has emerged in recent years as a treatment possibility. In ESWT, shockwaves are applied directly to the tibia to encourage new bone growth. Only one study has tested ESWT, and it suffered from some design flaws, but it showed a significant reduction in recovery time.14 ESWT treatment may be expensive and difficult to find, and its experimental evidence is still not up to snuff. These are methods that are fairly simple, inexpensive, and can be done on your own at home. Work to reduce stress on the tibia by increasing your stride frequency by 10% or so to avoid overstriding and excessive impact. Calf raises starting with one set of 20 repeats and building to three sets of 20 (or more), twice per day. Modify your training so you don’t put as much stress on your tibia. Reducing mileage, intensity, and duration of your runs will all help. Remember, it can take several weeks to a few months for the tibia to heal. These are treatments with more cost and less certainty about outcomes, but may prove useful in recalcitrant cases. Custom shoe orthotics or over-the-counter semi-rigid orthotics (SuperFeet, PowerStep) may be able to modify how forces are transmitted up the tibia, though this is unproven. Many runners find that orthotics greatly improve their shin pain, but possibly just as many find that they are no help. Consider running in a thinner, firmer shoe on a harder surface. While the actual benefit for people with shin pain is as-of-yet unproven, biomechanics research has linked soft surfaces and soft shoes with higher leg stiffness, which is itself connected to higher shocks going up the tibia on impact. If conservative treatments don’t help, you also should be evaluated by a doctor for a tibial stress fracture. X-rays are very inaccurate for diagnosing stress fractures, so your doctor should use either an MRI or a bone scan. MRIs are slightly more accurate and allow your doctor to get a better idea of the severity of the injury, so they are generally the preferable imaging technique. You will need to modify your training program to allow your body time to strengthen your shin bone. Mild cases of shin splints may only require modifying your running form and doing some lower leg strength, but more serious cases will require at least a few weeks off. Keep in mind that shin splints are the same type of injury as a stress fracture, so if you feel like your shin injury is getting worse, you should not continue to run on it. While many coaches recommend that a “10% rule” for increasing mileage is best to avoid injury, the dynamics of the tibia’s healing mechanism suggest that perhaps a stress/adaptation cycle would be better. So, instead of increasing mileage every single week by 10%, you might increase by 10% for three weeks, then take a “down week” to allow your tibia to recover (ex. 40mi-45-50-40-50…). If you do need to take time off running, don’t panic! This podcast episode with American Record Holder Alan Webb, ElliptiGO manager Darren Brown, and pool running expert Lynda Huey will leave you feeling confident that cross training will make sure you maintain fitness. If you are worried about losing your fitness, this may help you feel a little better, and remind you that it is better to take a few days off early to let your shin pain calm down, than keep going and end up taking 6 weeks off. Good luck with your shin splints. Let us know in the comments section if you have any helpful remedies or if you have questions we can answer. 1. Taunton, J.; Ryan, M.; Clement, D.; McKenzie, D.; Lloyd-Smith, D.; Zumbo, B., A retrospective case-control analysis of 2002 running injuries. British Journal of Sports Medicine 2002, 36, 95-101. 2. Marti, B.; Vader, J. P.; Minder, C. E.; Abelin, T., On the epidemiology of running injuries-the 1984 Bern Grand-Prix study. The American Journal of Sports Medicine 1988, 16(3), 285-294. 3. Plisky, M. S., Medial Tibial Stress Syndrome in High School Cross Country Runners: Incidence and Risk Factors. Journal of Orthopaedic and Sports Physical Therapy 2007, 37(2), 40-47. 4. Bennett, J. E.; Reinking, M. F.; Pluemer, B.; Pentel, A.; Seaton, M.; Killian, C., Factors contributing to the development of medial tibial stress syndrome in high school runners. Journal of Orthopaedic & Sports Physical Therapy 2001, 31(9), 504-510. 5. Yates, B., The Incidence and Risk Factors in the Development of Medial Tibial Stress Syndrome Among Naval Recruits. American Journal of Sports Medicine 2004, 32 (3), 772-780. 6. Sharma, J.; Golby, J.; Greeves, J.; Spears, I. R., Biomechanical and lifestyle risk factors for medial tibia stress syndrome in army recruits: A prospective study. Gait & Posture 2011, 33 (3), 361-365. 7. Beck, B. R.; Osternig, L. R., Medial tibial stress syndrome. The location of muscles in the leg in relation to symptoms. Journal of Bone and Joint Surgery 1994, 76 (1057-1061). 8. Magnusson, H. I.; Ahlborg, H. G.; Karlsson, C.; Nyquist, F.; Karlsson, M. K., Low regional tibial bone density in athletes with medial tibial stress syndrome normalizes after recovery from symptoms. The American Journal of Sports Medicine 2003, 31 (4), 596-600. 9. Heiderscheit, B. C.; Chumanov, E. S.; Michalski, M. P.; Wille, C. M.; Ryan, M. B., Effects of Step Rate Manipulation on Joint Mechanics during Running. Medicine & Science in Sports & Exercise 2011, 43 (2), 296-302. 10. Butler, R. J.; Crowell, H. P.; Davis, I. M., Lower extremity stiffness: implications for performance and injury. Clinical Biomechanics 2003, 18 (6), 511-517. 11. Bennell, K. L.; Malcolm, S. S.; Thomas, S. A.; Reid, S. J.; Brukner, P.; Ebeling, P. R.; Wark, J. D., Risk factors for stress fracture in track and field athletes: a twelve-month prospective study. American Journal of Sports Medicine24 1996, 6 (810-818). 12. Madeley, L. T.; Munteanu, S. E.; Bonanno, D. R., Endurance of the ankle joint plantar flexor muscles in athletes with medial tibial stress syndrome: A case-control study. Journal of Science and Medicine in Sport 2007, 10 (6), 356-362. 13. Beck, B. R., Tibial Stress Injuires-An Aetiological Review for the Purposes of Guiding Management. Sports Medicine 1998, 26 (4), 265-279. 14. Moen, M. H.; Rayer, S.; Schipper, M.; Schmikli, S.; Weir, A.; Tol, J. L.; Backx, F. J. G., Shockwave treatment for medial tibial stress syndrome in athletes; a prospective controlled study. British Journal of Sports Medicine 2011, 46 (4), 253-257. 15. Lappe, J.; Cullen, D.; Haynatzki, G.; Recker, R.; Ahlf, R.; Thompson, K., Calcium and vitamin d supplementation decreases incidence of stress fractures in female navy recruits. Journal of Bone and Mineral Research 2008, 23 (5), 741-749. The tenderness is always there. It is most noticeable after running a faster pace. Too much speed for too long and it really barks at me. Icing helps as does stretching and rolling the calf on the same side. I already ran in OTC orthotics (Superfeet) but I cannot say if they help with this or not. The type of shoe I wear seems to make little difference. Low drop or medium drop, mild stability or neutral, cushioned or not it all comes down to my pace. If I stay away from the redline it is quite manageable. And since the sfx I have taken calcium supplements. I have done some strength work but likely not enough. I’ll give that a try and dedicate several weeks to the program you outline above. Hopefully that will help. Thanks for the useful information. Let us know if the strength exercises help! Hi James! I am going through the EXACT same thing…I had a stress fracture on the inside of my lower right leg (happened while coming back from an ankle sprain). It was July when I was announced healed, but I am still experiencing pain around the spot where my stress fracture was. I just got an MRI, and it came back clean. The dr says I’m just battling shin splints. It is heartbreaking because I am a sub 3-hr female, but yet, I don’t even feel healthy enough to do a workout. I worry that I’ll never be able to train and race again. I was curious if you had any updates or had any tips? Thanks so much!! I can totally understand your heartbreak. I am not an experienced runner, but began training for my first marathon. I was building mileage slowly and doing really well for a few weeks. I was in such a good mood because I finally felt like I was on my way to wellness with a good fitness routine in place. Then shin splints got so bad I had to stop. I haven’t run in two weeks and I’m afraid to try again. I’ve been doing some strength training. But I’ve been pretty sad because I feel like my running program is doomed. Where I live, I am surrounded by hills, so I think that is the main reason my shins hurt so bad. But I can’t avoid the hills. Good luck to you! Hi Emmy, thanks for sharing your experience. Sorry to hear about your shin pain. You can get back to healthy shins, but make sure you keep up with those exercises, and make sure your shoes are definitely right for you. Have you listened to our podcast about gait analysis? You may enjoy it https://runnersconnect.net/rc43. We also have one on injuries you may enjoy. Just let us know if you want the link. Hills are unlikely to be the biggest aspect of your shin pain. Give the tips we recommended in this guide, and see how you get on. Hills are murder on shins and on knees, especially going down hill, which is the most strenuous thing you can do while running in terms of musculo-skeletal fatigue. I made the mistake of incorporating hills too early in a training regimen and in too big a chunk. My first real knee pain and return of shin splints with a vengeance happened right after I added a 1 mi downhill with a steep 1/4 mi rise to my route. Cut the hills out as much as possible for recovery. A year ago I had to stop all sports and running due to shin splints. I couldn’t walk without pain especially in cold weather. A podiatrist told me I had fallen arches and i needed insoles else I would have shin splints for the rest of my life. I did nothing for a full month. Then started barefoot running. 100 meters a day at first, increasing each week by a little. I started landing on my mid foot and my cadence increased. Then I bought some vibram’s and can now run 10 miles in a city on concrete. Shin splints have never returned. I have no pain while running but a few hours after running my shin muscle throbs and i feel an occasional pulling. Could this be a MTSS or a stress fracture? Is it possible that this is delayed onset muscle soreness? I’d check into that. I don’t have any professional education in this but the soreness in the muscle is unlikley to be a result of MTSS. The pulling, however, could be. If you’re experiencing it along the inside (or outside) of the shin bone (typically more towards the ankle on the inside), it might be MTSS. I’ve had MTSS issues for years. Particularly after having multiple ankle injuries including a stress fracture. This article seems very useful for addressing shin splints (strengthening and increasing cadence are definitely two things that have been helping my very slow progess). Back in 2000 I was in the army and suffered from shin splints. I saw a Dr and was told to sit out of PT for about a week. Fast forward to 2014 and when I run or walk for more than 29-30 mins I still suffer from it. Could this be an issue from 2000? Hi Pualani, it is most likely that you have just redamaged the tissue. It is near impossible to determine an exact cause of your current pain, but it would be best to take our suggestions from this post, and help it calm down before you continue. Make sure you build up slowly also! Hope this helps! What specific shoes do you suggest? Hi Ashley, we cannot answer this question for you, as a lot of it comes down to your personal comfort. You should listen to our podcast to hear about how you can select the right shoes for you; https://runnersconnect.net/running-interviews/matt-phillips-gait-analysis/ Hope this helps! Good luck! Thanks for sharing Phillip. Be careful with the pain, and monitor it as best you can. Hopefully the suggestions we had provided you with some assistance of how to strengthen the surrounding muscles. It seems that every time I start running again (I do intervals of one minute running, 1 minute power walking) after resting for my shin splints, they return after a week or so. After reading this I realized I was heel striking and reducing my gait as well as making sure to land on the middle of my foot has seemed to help me a good deal, so thank you! I am trying to find a description of some of the exercises you mentioned, but am coming up short. Could you describe the feet in/out walk and ankle in/out walk? And the shin exercises with theraband? As for the exercises, this article has videos of many of our exercises that may be helpful for you, as these will help prevent future injuries https://runnersconnect.net/running-injury-prevention/shin-splint-exercises/. To have access to the rest of the exercises, your best bet is to sign up to our newsletter (at the top of the page), and we will send you emails tailored to your needs. Which will hopefully give you the information you need. Hope this helps! Hello, recently I been feeling pain in both my legs and everyone tells me its shin splints. I usually run for an hour- 40 minutes, 5 days a week. I stared exercising 6 months ago and since I got condition, I’ve been running/jogging as much as I can. Several times, I’ve stopped running because my legs are in pain. When I walk fast, they also hurt. For how long should I rest? Should I go see a doctor? Will my legs get better any time soon if I stop exercising for a while? Hi Dinorah, sorry to hear that, but yes, your best bet would be to see a doctor to find out what is going on. This article should provide you some assistance with other steps you could take, you should try to stay away from pavement/cement and move towards grass surfaces. The pain will likely subside after some rest. Hope this helps! I think I have shin splits, but I’m not sure. The pain I get is on the outside of my shin, and oddly it hurts the most when I slow down to a walk after a bit of running. For example – today, 5 minute walking warm up, then 5 minute run at 6.2mph, slow back down to a 3.6mph walk, and the pain kicks in, and is a solid 6.5 on the pain scale. I slow down to a 3.1, and the pain fades quite a bit, but I can still notice it. Run again for another 5 minutes, and a couple tweaks of pain, slow back down to walk, and the shins ache at about a 3.5 on the pain scale. I only run/walk anywhere from 30 – 60 minutes at a time, trying to build my endurance. Other days they will hurt during the run and walk. I bought a foam roller, and have started using it daily, plus a resistance band to do lower leg stretches from my physiotherapist. It doesn’t really sound like true shin splints though. Maybe I’m just “different”. Hi Dawn, that does sound like the symptoms of shin splints, a lot of injuries are most prevalent after running. You are definitely normal, and a lot of runners have this. If you follow the exercises and suggestions in this post, you should find some comfort. It does not sound like your shin pain is bad enough to require time off….yet, if you take care of them, you can continue to run/walk, but keep an eye on it. If it gets worse, then you may consider some rest. Personal experience resting was no help as it starts up again shortly after. Change shoes and try shop bought arch support if you have a low arch. Bare foot runs good and increase cadence if you have been running for a while most injuries are just a reminder of good running form head over heels etc. To get running again I have found do race walking for a week following week ease the walking into nice form jog stop when pain comes in and walk again to finish exercise. Increase till you forget you had an injury. Long compression socks also good when exercising and also in bed nothing like making the injured area sweat while resting. Hi Paul, thanks for sharing your thoughts, some great tips there. For shin splints though, most people will need the rest for their shins to recover. You are right though, runner will need to make sure they make the changes so they do not happen again, and we are big fans of the walk run method. We have a grew podcast you may enjoy listening to if you want to check it out https://runnersconnect.net/rc43. Hope you enjoy, and thanks for your recommendations! I have been doing the new Insanity workout, Insanity Max 30, for 3 months now. It has tons of jumps and directional changes. You basically jump up and down in various ways for 30 minutes straight. About 2 weeks ago my left shin started hurting, at first around the posterior tibia, inside lower tibia. At first I thought it was just soreness but after 2 weeks I also started to feel pain in my anterior tibia area, running on the outside tibia about midway up my shin. I have since cut back and shifted to the modified workouts that remove the jumping. Any further advice? Everything I find is in regards to running. Hi Adam, sorry, we are not experts in those kind of workouts, we are running focused. The only thing we can help you with is maybe pointing you towards this post, as it is related to high intensity intervals https://runnersconnect.net/running-injury-prevention/sprint-training-for-distance-runners/ I think the exercises we presented in this post you commented on will still benefit you regardless of what activity is causing your shin pain. Hope this helps! running and jumping uses two different sets of muscles, and jumping causes a lot of shock to your tibia. you need to pick one set of exercise, because those two sets of muscles work against each other. i do alot of running and jumping myself, but i try to land softly to reduce shock on my tibia. I am a cross-country and track runner I got shin splins during the middle of xc session in 2013 and track 2014 my coach had me run on them I had to take the next xc session off and I am in track again and they have been bothering me again for about 3 weeks. Why can’t I run on them? What is the repercussions if I continue to run on them? I absolutely understand how you feel because I experienced the same. In HS I was really into running track but my shins gave up on me. I made a deal with couch that I’d be practicing in gym and swimming, running only competitions. I ran on pills like ibuprofen and so on to alleviate the shin pain. If your track couch doesn’t understand your pain, leave the team. I know it’s hard to do but as couch Tina said it’s better to be safe than sorry. Build your endurance/speed over the next year and get ready for next track season (if there is non just keep yourself fit and focus on studies 😉 ) Wish you luck and good decision-making! Hi Katie, thanks for reaching out. This post was written on 24th October 2012. Hope this helps, and thanks for using us as a resource! I am a runner who has never had any issue with shin splints, fractures ect. I ended up getting shin splints about 1.5 years ago and did the whole rest thing. got back to my running after and everything was fine. then this past winter my exercise was off and I was running but not the long miles I normally did. I have good running shoes, I get the motion control plus shoes and I just got good Compression socks to try and use. I ended up getting what I thought was shin splints off and on this past winter. Then just this week I got my compression socks and tried a short run/walk with them. started off good and then my lower legs felt strained. (liked when you flex your foot towards your leg) so I would then walk. I got done with the run/walk and felt pretty good. Then next day my shins/lower legs felt a bit off, then as the morning and day went on my shins burned. So I didn’t run yesterday at all. woke up today and as the morning went on my shins are burning more and more….the burning on my left leg is toward s the inside towards the top and on top of shin. on my right leg it is down the top of the leg…. I am frustrated as this has been going on a good chunk of the winter off and on. I stop the running, still try to do some other exercises ( I was in a HITT challenge this winter) and then go back to running and same thing…. Can I still run but use the tape along with my compression socks or do I need to stop all together for the time being? Also is it normal for them to burn so? Hi Rachel, sorry to hear about the shin splints. Are you sure it is not the HIIT that is casuing the shin splints, were you doing that in the past? We see a lot of correlation between HIIT and shin problems for runners. You may need to prioritize which is more important to you. The training of both may just be too intense for your body. You may also want to check out this post to show you what exercises to do to strengthen those calves to hopefully prevent it in th future https://runnersconnect.net/running-injury-prevention/shin-splint-exercises/. You would be best off taking some time off to let your shins calm down if they are already that painful, and re-read this post for how to help speed the recovery process. Hope this helps! I devote a lot of time to stretching post run, rest well in between long runs and I also take Vitamin D and Calcium supplements. I’m really worried about my chances to complete the marathon in July. I’m skipping my short run today in hope to aid recovery. But I have a 14 miler coming up this weekend. I’ve been icing both legs and taking ibuprofen. And today I will start with the exercises described in this article. But since this is the first time I’ve ever experienced this I am unsure to how proceed. The pain goes away while running and only comes back when I have to stop, for example at a traffic light. Then it hurts for a little while again when I resume. Is it wise to continue with my training, or would it be better to take some time off? Is this something I just have to get through, something that will get better as I get stronger and might go away if I make changes like slowing down, shortening my stride and doing strength exercises? Or am I possibly sabotaging my chances of completing the marathon in two months? Hi Jeana, sounds like you are making all the right decisions to be smart with it, but unfortunately it is unlikely to calm down in just a few days. The exercises we talked about in this article along with the icing will help. Try to stay off the road and on soft surfaces. Also, how new are your shoes? This would be a good time to get a nice supportive new pair to protect your shins a little. If you do decide to take time off, now would be the time to do it. You could try giving them a week off and cross train instead, that way you can keep your cardiovascular fitness up. Hope this provides some comfort to you, if we can help any more, let us know! Thanks for your reply and advice Tina, much appreciated! My shoes are still in good condition, I think I just might have been pushing a bit hard. It was really hard to skip my run yesterday, and I really don’t want to miss my long run this week end. So I’m wearing compression socks, massaging my shins and doing those exercises, and I already feel much better today. Hopefully I will be back on track soon..
Hi Jeana, glad I could help a little, keep up the exercises, and best of luck! I started the Couch to 5K plan a couple of days ago and my shins hurt after the very first day. It feels like muscle pain. Like after a good hard strength workout. Could that be shin splints? I went ahead and did the 2nd day today even though they still hurt. Now I’m worried that I won’t be able to continue the program. I have never run before but regularly do jazzercise and yoga (for about 5 years). Do you have pictures on how best to use tape with shin splints? I got shin splints awhile back, for what reason I wasn’t sure. I play soccer and I strengthen my calves and other muscles a lot. I had kept going on it for a long time and finally a month or so ago it finally felt better after a week or two of no soccer. I ran on the treadmill a bunch of times and at soccer, and I was fine. Last weekend I ran 2 miles in 12 minutes two days in a row on cement, and then two days later I was playing soccer. My legs weren’t ‘t bothering me after those runs, but then on tuesday (two days after that) I went for a run and noticed it was bothering me. Just the bone hurts, not the muscle. I’m a very experienced and fast runner and I hadn’t had this problem until this year. I’ve been taking bone supplements and ice seems to help, but now I can’t run well without it worsening. Soccer practice bothers me and I need to continue training for soccer and highschool soccer. I need to make sure that I wait for it to get better before I run again so that I can fully get back into training and soccer. I have a tournament in 20 days and I’m worried. Tomorrow I’m going to see if I can run on a softer surface slower than usual to start and see how it does. I’m worried about being unable to run and I don’t know what to do. All I know is that no matter what, I’m staying away from running on cement because I don’t even want to risk this happening again. Cement running is fine to jog on, but it’s not for running at high intensity. Anyway, I’m really worried about my shin splints messing up my fitness and getting in the way. Also, running on soft is your best shot of keeping them happy. Best of luck! Thanks for your article, really interesting. I am experiencing shin splint for 3 years now, that’s a nightmare. I ranseveral times half-marathons, and I think it started when I started training on hard surfaces instead of soft. I stopped running and practised swimming, mountain bike, strength training (and especially exercices on calves). I had tailor-made orthotics and several massages and ultrasounds… (and didn’t run for at least 2 years). I started running again progressively, last year; but I avoided doing more than twice a week, no hard surfaces, icing after workout; that went quite well and I thought I finished with shin splint. Then in 2015 I ran again on hard surfaces as I don’t have many choices, and it get worse. Now, even when I am walking fast, it is painful, I can’t run even 3 minutes before I need to stop absolutely. I can’t jump, I can’t dance, and all collective courses are very painful. Jumping jacks, burpees hurt me if I do them too long. I got shin splints in the end of last year’s cross country season and my coach made me continue to run on them. We did two-a-days, running in the mornings and semi light runs in the afternoons. I am now a sophomore but in last season it was my first actual cross country season, so I am assuming I got them because I was working with the fast girls and it was just too much for my body to handle. After continuing to run on the pain, I finally went to the doctor and got bone scan that showed that there was indeed a stress fracture. I ended up sitting out for a little more than six weeks. It ruined my basketball season as well. The pain never truly went away, but I needed to be back for basketball. The pain would come every once and a while after a really hard workout. I am now doing a running camp this summer and the pains are returning and they are pretty bad. I don’t think that I started up too fast at all, but I’m really scared that the stress fracture is reforming and that could mean an end to this year’s cross country and basketball season, which I really don’t want. I read this article and I have stopped the running camp and I am just doing elliptical daily with some core exercises. As for working on the shin, I have just been doing calf raises on my stairs. If you have any more advice, I would really appreciate it. My dad said we might try insoles and I have been trying compression sleeves. Hi Sarah, thanks for reaching out. The best advice we can give you is in this post; to religiously follow the recommendations in this post, and see how it helps. If they are bad, you are doing the right thing in taking some time off now, so you do not miss your season. It would be good to tell your coach about this. If you began playing basketball before the pain had gone away, it probably did not get enough time to heal, especially if you ran on them for so long. Your best bet is to rest now until they do completely go away. Unfortunately a broken bone needs only one thing; time to heal, it is up to you when you take this time, but in my opinion it would be best to take time now and miss part of your season, then miss all of your season by returning too fast. We also have this post that would be helpful to you https://runnersconnect.net/running-injury-prevention/how-to-return-to-running-after-a-stress-fracture/ hope this helps! Hello. I really appreciate this article and plan to do the strengthening exercises for my shin splints. I’ve been trying to lose a little weight (15 pounds), so I started running after months of not running (hence the shin splints). I know that in addition to the strengthening exercises and icing my shins, I need to stop running for a couple weeks to allow them to heal. My question is then, what cardio can I still do (I don’t have a gym membership). I was considering doing stair workouts and biking. Any advice for me? But you also should take a listen to this podcast; https://runnersconnect.net/crosstrain because you will learn that as long as you are doing something (other than maybe stairs for you as you have shin problems), you will be able to keep up your training. Even walking is better than nothing. Hope this helps! Let us know if we can do anything else. Hi Carrie, our best advice is above this comment in the post itself! If you follow our advice, this is your best shot of making sure it does not come back again. The compression socks were unlikely to have made that big of a difference to make them worse, but jumping definitely could have contributed. Make sure you are not over striding when you run (if you said you heal strike) as that can make shin splints worse, here is a post on that https://runnersconnect.net/running-training-articles/heelstriking-running-cadence/ Hope this helps! I am not sure if I am getting a shin splint. Ever since I got my shin jammed, at first is swelled up and then I couldn’t do any sport for about a week and that was a year ago and ever since then whenever I do sport I get extreme pains in my left shin at the front and I literally cannot step on that leg. I searched as much as I could but I can’t find anything but shin splints. I really need feedback on any way to prevent these pains because I do PASS. Hi Nicolas, sorry to hear about your shin splints. 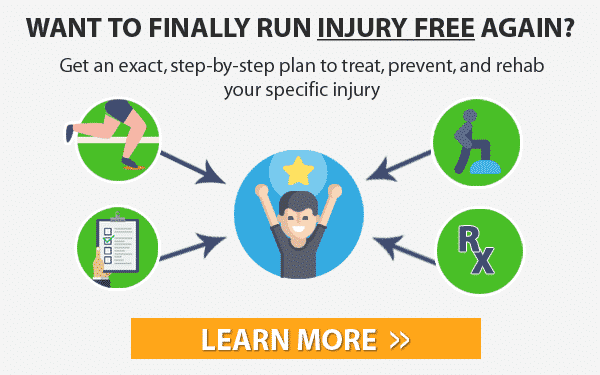 This was created for runners, and your best bet is to probably check in with your physician as it would be impossible for us to tell you exactly what is going on. This article was created for runners, but can be used by other people. Give the exercises a try, and give it a little more time to rest. A week would not be enough time for your body to heal, and it may continue to give you trouble until you do rest. Best of luck! I had shin splints last may rested for a month and ran a 5k in june. I started swim team this summer and havd been using it as cross training kfor my running. 5 days ago i started training for running again and on the third day of training got shin pain. I was planning on doing cross country this fall and it starts in one week. Do you think i could do it with the condition of my shins or should i skip this season- that would make me super sad. Hi Kayla, thanks for reaching out. Sorry to hear about your shin pain. It would be best to listen to our advice in this post with regards to the strengthening exercises and ways to ease the pain, and see how you get on as the season goes on. You could also see your athletic trainer to see what they think. You could continue to cross train during this time, it will help your body adjust without the impact of the pounding through running. Hope this helps! probably i have shin spilits,becouse when i run i dnt feel any pain but as i stop running i feel too much pain above my ankle,i think,near shin muscle….and i wont stop running because i have my running competition after 10 days..plz suggest me what should i have to do. My son had horrible shinsplints from over pronation and was a big heal striker. Correcting technique was not enough. Find a PT that uses the Graston release method. It solved my son’s shins in less than 2 months. You can do it yourself after a few treatments. Hi Steve, sorry to hear about your sons struggles with running. Thanks for sharing that the perseverance through the exercises was what really makes a difference, that is what we hoped would come across in the article. We appreciate your thoughts! 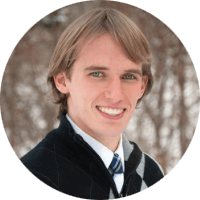 My son has always been active, playing soccer, basketball, and running sprints and hurdles in track over the years. This past spring he suffered from shin splints during track. He saw a chiropractor, as his calf muscles kept tightening up too. We found out his arches are falling, which is contributing to his leg problems. He sat out some track meets but the pain never went away and he struggled just to finish the season. He rested his legs this summer until the middle of July, when he started building up his running (and he now has custom orthotics to help). He hasn’t played basketball for a few years but decided to try for his upcoming senior year. It’s been about 1 month now of working out with other players and attending open gyms and his shin is starting to feel sore again. Should he be doing other exercises to help his issues? Will vitamins help keep the shin splints in check? He really wants to enjoy his senior year and I hate to see him in pain and unable to participate in the sports he loves. Hi Kathy, thanks for reaching out. Sorry to hear about your sons shin pain. It is good that you were smart about it, and allowed him to rest. The best bet would be to follow the exercises we recommended in this post. That will strengthen the muscles around the shins to take the strain off. Our best recommendations are in this guide, so give it a go, and see what happens. Vitamins are not going to help, but instead you may want to spend the extra money on getting him a massage to loosen the muscles of the calf. Hope this helps! Good luck! I’m a frustrated runner (44 yo). I have been running for about 8 years (completed 3 full and several half marathons). Suddenly about 1 year ago I began feeling pain in my left shin while running. Naturally I tried to “run it off”. By Jan. I was in the Dr office with a tib/fib sfx. Wore a boot for 7 weeks (crutches for 2 weeks) and was given the ok to start running in April. I have been working my way back very slowly ever since. I currently run 4 miles 3 times a week with walk breaks (never 2 days in a row). Every time I run I feel pain! My last Dr visit was in May & he said the sfx was healed and I just will have to deal with shin splint pain. How can I still feel so much pain after 6 months of a very conservative comeback? I’m finally beginning to feel comfortable running again, cardio and endurance wise, but my leg is ruining it for me. Anyone else have this long a recovery? Should I just give up my running shoes and replace them with walking shoes? Hi Elizabeth, thanks for reaching out. Sorry to hear about your shin. It would be a good idea to go to a running store and try a new pair of shoes (are yours running shoes? How old are they?). Unfortunately, there are too many variables to where we cannot fully answer your question, but you have a right to be frustrated as there is definitely something going on here. Did you start the exercises we talked about in this guide? That will help to strengthen the muscles, to prevent the pain n the future. You may also want to look for another specialist to talk to, as “dealing with shin pain” is not ideal! Sorry we cannot give you any more help! Hi Alex, sorry to hear about your pain, it is good you are being smart about your pain. Unfortunately it is impossible for us to diagnose, so it would be best to talk to a physician about your pain. If we can help with the rehab process once it is diagnosed, let us know! Thank you for all this very good information. I started a walk / run program and I am doing very well. I noticed however that my left leg shin was excessively swollen, but I am not experiencing the pain described by the people affected by MTSS. Is the swelling a precursor to the pain or just another condition. Wondering if I should continue the training or pause until the swelling subsides. From my experience, anytime you have swelling you should perform RICE. That is rest, ice, compress, and elevate the area. So I’ve only been running for about 3 years. I have played water polo and swam most of my life. I have been running on a collegiate team for the past year. I was fine during cross country season. Then I had an injury on my knee and I sprained my ankle after season. In between seasons, I got back into running, but I guess I did too much coming back. Once track season started I was getting shin splints. I was told to take two weeks off from running, but I was biking and swimming. I did’nt feel pain coming back. I recently sprained both of my ankles again and after about a month and a half I am running again. I got super feet insoles and they help. Now I am starting to get the shin splints again. I have been doing ankle exercises that include calf raises too. I will try incorporating the rest of the exercises too. I also heard doing more weights would help increase bone density. Is that true? Ive just started back running after 10-15 years off. I was more into biking. Any who.. My shin pain is literally excruciating but I don’t want to quick running.. I absolutely love it, really for the first time in my life. I was wondering if I could go to my doctor and get cortisone shots in both legs so I could work through the pain?